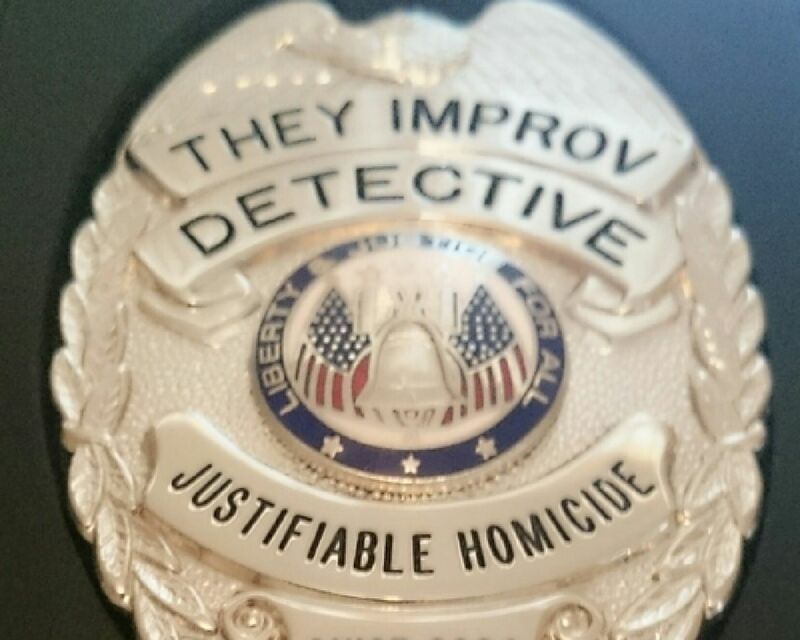 THEY improv provides Cambridge Solution murder mystery dinners as a way to enhance the interaction and provide for bonding and team building for participants. 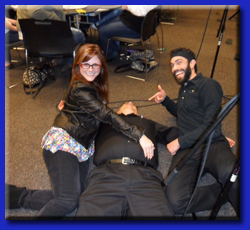 For your entertainment, THEY have a variety of scenarios that can fit most any corporate event or private party. Beyond those, we can customize new scenarios as well. "The Spy Who Killed Me" or "The Death of 008"
THEY improv works with groups of all sizes and discovered a need for a mid-sized event in addition to their small and larger event options. The Cambridge is the solution to that problem. The Cambridge Solution is designed for groups between 30 - 100 people, though it can serve larger and smaller groups as well. 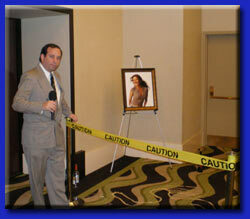 This custom-built murder mystery party uses 4-10 people from your group as characters in the murder mystery. These characters talk to everyone at the party and answer questions. They had been provided with information that they know about themselves, know about each other and know about the crime. This doesn't require quality acting, just a fun spirit. Towards the end, we bring the suspects up and ask them for their likely excuse and to answer one question (both of which they had been provided with ahead of time). This is their Oscar award winning moment as they try to win a vote by the audience for the best actor. The event usually runs the full course of dinner, from salad through dessert, but can be scheduled to operate in other ways. Contact THEY improv for more information on how a Cambridge Solution can be the perfect corporate or private murder mystery for your team building, charity or simply entertainment needs. This scenario involves a gathering of the well known and not so well known people that have influenced MI-6, the British Secret Service. They've all gathered to celebrate the long and not-so-illustrious career of special agent 008, the less famous super-spy since his more famous counterpart has gotten all the plush assignments. He was going to announce his retirement and just prior to making his entrance, was found dead. The rogues gallery of suspects includes a variety of characters including M, Q, the Man With the Copper Gun, Dr. Yes and many others. The characters go from table to table and try to get their point across to the audience. This scenario has also been played with slight offshoots including other famous spies for an additional fee. With THEY improv, customization is our specialty. Practically anything else you can think of for your group. We have a wide array of additional scenarios. If you have a specific theme in mind and if you don't see them above simply ask. Every event is completely customized, so don't be afraid to make a request. Contact THEY improv to find out the variety of shows available and how hiring THEY improv is a winning proposition for everyone. Email THEY improv at info@THEYimprov.com or by phone at (866) 219-4386.